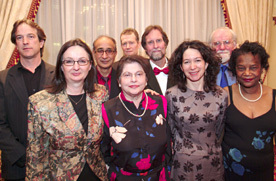 At the back are David Mumby, acting principal; Ramesh Sharma, Fellow (Physics), Vesselin Petkov, LTA in Philosophy, Michael von Gr�nau, principal (on sabbatical), John McKay, fellow (Computer Science/Mathematics). In the front row, Diane Poulin-Dubois, fellow (Psychology), Acting Dean June Chaikelson, Natalie Phillips, fellow (Psychology), and Lillian Jackson, assistant to the principal, who organized the event. Twenty-five years of encouraging young scientists can put a smile on your face, and there were plenty of those on March 12, when Concordia’s Science College held a dinner dance at the downtown Omni Hotel. About 150 students, alumni, fellows and guests were on hand. The guests of honour included founding principal Elaine Newman, her successor, Geza Szamosi, and Acting Dean June Chaikelson. An estimated 350 Concordia students joined upwards of 100,000 others from Montreal colleges and universities yesterday to march through downtown streets.